The offensive onslaught that defined Tuesday night’s game against Gonzaga was a thing of the past Wednesday as the Ducks took game two with a 2-1 victory. A solid performance from freshman Jacob Corn and a business as usual performance from the bullpen secured the Ducks’ third consecutive win before they head to Utah this weekend. Corn had no trouble working through the first three batters he faced, setting them down in order and using just six pitches to do it. He found himself in a jam in the second as Justin Jacobs ripped a single into left that Mitchell Tolman nearly pulled out of the air. A double by Caleb Wood put both runners into scoring position with no outs. With the pressure on, Corn picked up his single strikeout on the night. After hitting Tyler Frost to load the bases Corn forced Troy LaBrie to hit into an inning ending double play, keeping the Bulldogs off the board. Scott Heineman leads the team with nine stolen bases. The Ducks offense put up a fight in their half of the second as Phil Craig-St. Louis put the first pitch he saw up the middle for a single. Scott Heineman grounded to short forcing Craig-St. James, but beat the throw to first, avoiding a double play. He quickly stole second, picking up his third stolen base of the series and his ninth on the year. Nick Catalano laid down a sacrifice bunt to move him to third, but Daniel Patzlaff struck out to end the inning. Gonzaga drew first blood, scoring in the top half of the third. The Zags loaded the bases with three straight singles, testing the young freshman for the second inning in a row. Jones hit a sacrifice fly to right, bringing home Dustin Breshears and giving the Zags a 1-0 lead. 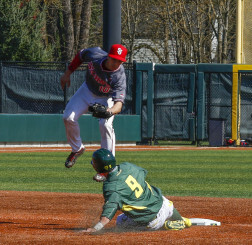 The inning nearly went sideways on the Ducks, but heads up defense took the wind out of Gonzaga’s sails. While putting on a double steal, Sam Brown nearly kept the defense distracted long enough for Mitchell Gunsolus to score from third. 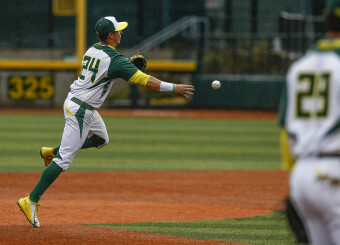 Mark Karaviotis saved the Ducks from a big inning with his strong defense. Mark Karaviotis showed great presence of mind by recognizing the situation and gunning the ball to Tim Susnara, pinning Gunsolus on his way home and picking up the second out of the inning. Corn finished the inning by retiring Jacobs on a grounder to silence the attack. The wheels began to come off for Corn in the fifth inning as he gave away three straight free passes, hitting a batter and walking two, causing head coach George Horton to call on Conor Harber. Harber looked as good as has did to start the season, forcing a double play to get Oregon out of the jam and retiring the first six batters he faced while picking up two strikeouts. Hitting behind Tolman has its advantages for Phil Craig- St. Louis. 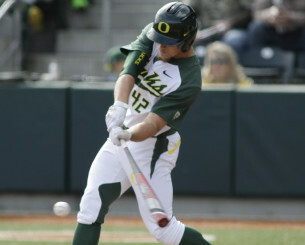 The Ducks offense woke up in the sixth with a two-out rally to take the lead and secure the win. Austin Grebeck extended his hitting streak to five games with a two out single to start the rally. Tolman drew his 39th walk this year and Craig-St. Louis made them pay, ripping a double down the first base line, plating both runners to give the Ducks a 2-1 lead. The bullpen continued to be nearly untouchable as Harber, Stephen Nogosek and Garrett Cleavinger allowed just two hits and struck two each over 3.2 innings of work. When asked after the game what he thought the key to the club’s recent success was, Horton told reporters that it came down to defense. “Our infield defense has been spectacular,” he explained. “It’s Duck baseball revisited — the orchestration of the plan, the execution of the plan, and the belief in the plan.” It has helped Oregon make a case for itself to finish the season. 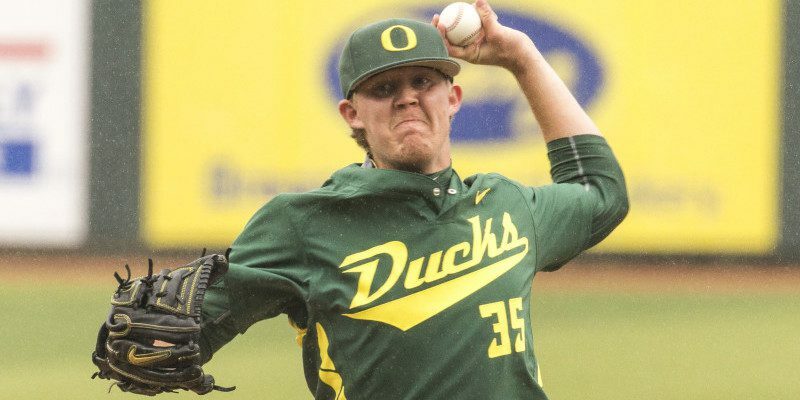 Pitching and defense have been the cornerstone of the program since Horton revived it in 2009 and those basics are giving the Ducks a fighting chance at the postseason.